Lifelong Financial Freedom in Singapore: Who Moved My Cheese? 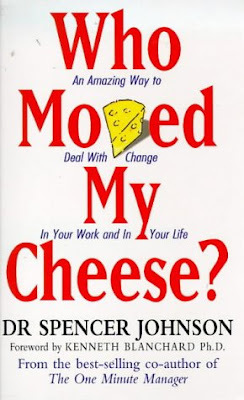 I was just happened to see this book titled "Who Moved My Cheese" in the library and borrowed it without a doubt. It was quite a popular title many years back. I managed to finish reading the book in an hour time. It contains a very short, simple and interesting story to illustrate how the 4 characters in the story react to changes. It is a great book and I will recommend it to all. After reading the book, I have listed below the main points for the story and how I will use them to aid my plan towards financial freedom. I must understand that ways of creating passive incomes can change over the time. I must get ready to change the ways of creating passive incomes. In my post "Keep learning and Increasing your Financial Knowledge", I have explained that we must keep learning to expose ourselves for more opportunities. I must review my current methods of creating passive incomes. Are these methods getting outdated? Are these methods still able to produce same amount of incomes as they used to be? Currently what I did is to review the amount gain from each of my passive incomes every month. If my current methods of creating passive incomes don't work any more, I must abandon them quickely and find out how to use new ways to create new passive incomes. I must learn to work out the new ways to create new passive incomes and enjoy the fruit of my new success. 6) Be Ready To Change Quickly And Enjoy It Again & Again. I must get ready to change again.